One of the Network bishops just popped into the newsroom and a small group of us gathered around and he told us what has been going on inside the House of Bishops. 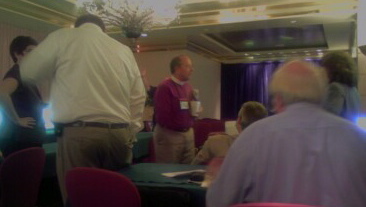 They’ve spent the morning talking to Rowan Williams who is listening and taking notes as the American bishops speak. Gene Robinson is seated in the center of the room. Katharine Jefferts Schori and Ed Little are moderating the discussion. One of the major issues of contention by the American bishops was on the topic of “border crossing” which of course means they are complaining about the work of the Global South in providing refuge and pastoral care for the Episcopalian laity and clergy who are in crisis. Also learned that there are at least four different statements/resolutions and Schori has appointed a drafting committee that will meet over the weekend. The presence of this bishop in the news room, a sitting diocesan bishop, nearly caused the TEC staff to jump out of their skins. It was clear that the only “interviews” they want done are in the controlled area downstairs, not impromptu in the news room. The only briefings they want done are the one’s they put together. What’s not clear is how TEC can schedule a media briefing at 4:00 and then expect all the media in the 9th Ward by 4:30 p.m. for the visit of the Archbishop of Canterbury. Do we want to go to a media briefing and learn what happened this morning in the sessions or do we want to watch the Archbishop of Canterbury do a walkabout? It’s only a photo-op, he’s not talking to the press. So if you were working for a national media organization, would you go to some wonkish “briefing” or would you go watch the Archbishop of Canterbury walk among the Katrina devastation? I’ll let you know what I decide. But I bet you all ready know. Gene Robinson has just walked into the newsroom. Also learned that some of those eight bishops did not know that they were going to be announced by Schori as DEPO Revisited. Schori did not take any questions, just announced the eight bishops and moved on. John Howe did know about it and mentioned at the Windsor Bishops meeting last night. But apparently there are others who did not know. Jim Rosenthall has also arrived and is giving his spin to the morning events. 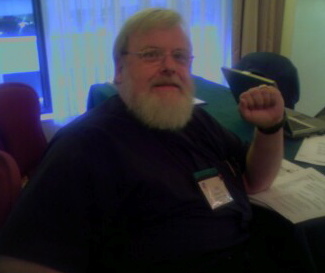 He says that 25 bishops spoke this morning, all focused toward Rowan Williams. Rowan will speak back to them this afternoon at 2:30 p.m. This entry was posted in Archbishop of Canterbury, Episcopal News, Presiding Bishop. Bookmark the permalink.